Podcast – As you start your day and week, be sure to listen to last night’s SethSpeaks.net Sunday Night Twins Podcast. Discussed a ton of Twins topics from the current lineup, to future Twins, to coaches, front office, and much, much more. On Tuesday night, I’ll be joined on the SethSpeaks.net Weekly Minnesota Twins Podcast by my choice for Twins Minor League Hitter of the Year, Brian Dozier. Check that out live at 10:00. I think it is fair to say that the 2011 Twins season has been incredibly bad. In fact, if you factor in preseason expectations, an argument could be made that this is the worst Twins season ever. The Twins have a lot to evaluate over the course of the offseason. They will have their organizational meetings in Ft. Myers in early October. In those meetings they will discuss and evaluate every single player in the organization from the big leagues down to the Dominican Summer League. It would be interesting to be a fly on the wall at those meetings when discussing any other changes to be made. Late last week, the Twins made the decision to fire Rochester’s manager Tom Nieto and hitting coach Floyd Rayford. Nieto had only been in the organization the past three years. Rayford has been around longer. The other managers in the system have been around longer and have more of a path to the big leagues set up. So, I would be surprised if any more get fired. However, there will likely be some rearranging. Could Jeff Smith make the next move, up to AAA? Would Jake Mauer move to AAA or AA? Tom Brunansky joined the organization’s coaching staff a year ago in the GCL. This year, he was the New Britain hitting coach. Would he want to manage? Bill Smith mentioned potentially going outside the organization for a manager. Do you think that the Twins could talk Mike Redmond out of the Blue Jays organization after being named the Midwest League Manager of the Year in his first year as a manager? Last year when I interviewed Elizabethton manager Ray Smith, he said that now that his daughter is out of school, he could potentially manage/coach somewhere other than Elizabethton for the first time since 1987. Speaking of Elizabethton, it was also announced that their pitching coach, Jim Shellenbeck, was going to retire. He has been the pitching coach in the Twins organization since 1978, including being the Twins pitching coach in 1983. He has been the E-Twins pitching coach since 1984. He pitched in parts of nine big league seasons, including five games with the Twins in 1977. He will turn 68 years old in November and is ready for retirement, so best wishes to him! I think that the Twins will try to make some room on the big league coaching staff for Paul Molitor. Personally, I think the best role for him would be as Ron Gardenhire’s bench coach. Molitor is very smart. He has not done well in his limited duty as a hitting coach in the big leagues, and I think that he could be a manager or general manager down the line, if he wants to. But the perfect set up for that is to be on the bench by the Twins manager for a couple of years. RON GARDENHIRE – Manager – Age: 53. The Good – Well, in his nearly ten full seasons as the Twins manager, he has an overall record of 862-743 (0.537). Six division titles in ten years. Finally won the AL Manager of the Year award in 2010 after finishing runner up five times previously. Is terrific at managing a team over the marathon of 162 games. Keeps the club loose, but behind the scenes, he can be tough. He is loyal and is willing to back his players. Doesn’t always go by The Book. As a former big leaguer, who struggled to get to the big leagues and stay there, he understands how difficult this game really is. He has been coaching in the Twins system since 2008. Led his teams to the playoffs all three years that he was a minor league manager before becoming the Twins 3B coach in 1991. Learned from Tom Kelly. The Bad – His teams have struggled in the playoffs. He can be tough on young players while giving veterans with track records some leeway (this is not a bad thing). At times, he may be a little too loyal to ‘his guys.’ (again, all managers are) Doesn’t always go by The Book. RICK ANDERSON – Pitching Coach – Age: 55. STEVE LIDDLE – 3B Coach – Age: 52. The Good – Advanced to AAA in 1988 with the Twins. Was manager in Twins minor league system from 1989-1994. Hitting coach for AAA in 1995-1996. GCL Twins manager in 1997-98. Twins Minor League Field Coordinator from 1999-2001. Twins Bench Coach from 2002-2010. Third Base Coach this year. Was instrumental in the development of the Twins core that came up in the late-‘90s. The Bad – Doesn’t wave runners around 3B very well. SCOTT ULLGER – Bench Coach – Age: 55. The Good – Played 35 games for the Twins in 1983. Managed in the Twins minor league system from 1988 through 1994. PCL Manager of the Year in 1993. Became the Twins 3B coach in 1995. Was the Twins hitting coach from 1999-2005. Was Twins 3B coach from 2006-2010. Became Twins bench coach in 2011. Is the Twins acting manager whenever Gardy gets ejected, which is quite often. Many believe that he could make a good manager. The Bad – Wasn’t a very good 3B coach. Wasn’t a very good hitting coach. JOE VAVRA – Hitting Coach – Age: 52. The Good – Advanced to AAA with the Dodgers. Minor League Manager in Dodgers system from 1989 through 1997. Twice Manager of the Year. Worked in Dodgers system from 1998-2000 as a Minor League Coordinator, Roving Coach, etc. Twins Minor League Field Coordinator from 2002-2005. Became Twins hitting coach in 2006. Although Torii Hunter said he couldn’t listen to Vavra, he later admitted that Vavra helped him get better. When Delmon Young actually listened to Vavra, he had his best year. When he did his own thing (or listened to his dad), he struggled. Mauer and Morneau have had MVP seasons and won Silver Sluggers. Mauer has won batting titles. The Bad – Twins offense this year is pretty bad. He hasn’t had enough time to work with the young hitters yet. If some want to blame him for the struggles of the likes of Mauer, Morneau, Span, Kubel, and other veterans in 2011, he has to be credited with their successes in recent years too. JERRY WHITE – First Base Coach – Age: 59. The Good – Spent parts of 11 seasons in the big leagues. Spent two years in Japan. Coach in Twins system from 1994-1996. Tigers first base coach from 1997-1998. Twins first base coach since 1999. Also works with the Twins outfielders and with base runners. RICK STELMASZEK – Bullpen Coach – Age: 62. The Good – Spent parts of 1971-1974 in the big leagues, playing for the Washington Senators (for Ted Williams), the California Angels, the Texas Rangers, and the Chicago Cubs. Player/Coach in 1978 with Twins A-Ball team in Wisconsin Rapids. Managed that team through 1980. He has been the Twins bullpen coach since 1981. Obviously the Twins’ brass will look at much more than the Good/Bad I did above. They are much closer to it than any of us, but this is just a start for discussion. This group has been together for the last six seasons when Joe Vavra joined the group that had all been in place since Ron Gardenhire in 2002. As you can see, for the most part, the coaches played in the minor leagues into the late 80s when they became coaches or managers in the Twins minor league system. While there, they all played a role in the development of those players that became the Twins’ core in the early 2000s. Aside from Michael Cuddyer, that group of players has been gone for a few years. These coaches had the utmost respect of those players because they grew up with them. Are these coaches reaching this new group of players? Johan Santana gave a lot of credit to Bobby Cuellar. Tom Brunansky did a terrific job with the hitters in New Britain this past year. Jake Mauer and Jeff Smith are well respected by minor league players. Jim Dwyer’s career as a player and now as a minor league hitting coach speaks for itself. This is a solid group of coaches that work well together. 2011 has been a tough year, so I don’t think that it makes much sense to over-react to the struggles. It isn’t as is this coaching staff was any different in 2011 as it was in those six division title years. But I do think that it would be wise to start interjecting some new blood into the coaching staff. The coaches are all in their mid-50s to low-60s. I think that it would be good to put a few younger coaches into the mix so that as the older coaches retire or move on, there won’t need to be a complete, 100% change. For 2012, I would like to see the following: Manager – Ron Gardenhire, Pitching Coach – Rick Anderson, Hitting Coach – Joe Vavra, Bench Coach – Paul Molitor, First Base Coach – Steve Liddle, Third Base Coach – Jake Mauer, Bullpen Coach – Ray Smith. Molitor and Mauer would replace Stelly and Jerry White in 2012. You may wonder if Mauer is too young to start coaching in the big leagues. He will be 33 years old in 2012, the same age that Tom Kelly was when he became the Twins 3B coach. Gardenhire will likely manage another 3-4 years, and Mauer can take over as manager at that time, about the same age as Kelly when he took over. Of course, Molitor, who is already 55, could also manage for a few years. If Ray Smith is willing to be a member of the Twins coaching staff, he would be a great addition. If he isn’t interested at this time, then Bobby Cuellar should take that bullpen coach job. I think that Bobby Cuellar needs to be ready to take over as the Twins pitching coach, if he wants to. I’d like to see Jeff Smith and Tom Brunansky move up to Rochester, along with much of their 2011 New Britain team. I would love to see the Twins find a way to bring in Mike Redmond and have him manage that New Britain team. I think that the Twins should have Nelson Prada take over as the manager in Ft. Myers. I also think that the Twins need to hire more Latin American coaches. Prada is really the only one in the full-season leagues. With so many young players from the Dominican, Puerto Rico, Venezuela in the organization, I think it is important. I’ve heard great things about GCL Pitching Coach Ivan Arteaga. The Twins should re-hire Rick Knapp in whatever role he’d like, maybe as a roving pitching instructor for a year or two again. Nieto and Rayford took the fall so far, but I do believe that there should be more changes coming in the offseason. I don’t think it needs to be a major overhaul, but I do think that they need to reward the top developers among their minor league coaches and put them in positions where they can help the most players succeed and be ready to succeed for the Twins. If you have any questions, comments, links, or anything, please feel free to ask in the Comments section. SethSpeaks.net Minnesota Twins Prospect Handbook 2011 – The Handbook is now available for pre-order, so if you are interested in a copy (or copies) of the book, scroll down this page for details on the handbook and on how you can pre-order. Pre-order available through Friday. Also, I will be on The Jack Michaels Show this morning about 10:05 to talk Twins. Those of you in the Bismarck area can catch it on ESPN 710. Those in other areas of the country can click here to listen live. But the Twins Caravan goes all over the Upper Midwest and visits schools and nursing homes, hospitals and car dealerships, and at night, they go to major events bringing hundreds of fans out. Last night, I went to Ralph Engelstad Arena in Thief River Falls, MN. First of all, what an incredible arena for high school hockey. When my daughter and I walked in, we watched a little of the Thief River Falls Prowlers high school hockey practice. Soon, we realized that Jeff Manship and Drew Butera were participating in the practice. I guess I should clarify; Drew Butera was participating. Manship was trying not to fall down. After a while, the team was all in a circle, and Butera gave a nice pep talk to the team, in part, thanking them for letting them play a bit. Now, I was a little bit slow, but knowing the event was supposed to start at 6:00 and not a lot of people were in the arena. Well, Engelstad has a huge conference room in the basement that fit the 500+ people that were there. Let me side track just slightly here. I brought my 4 ½ year old daughter, Jozie, with me to this event. She loves the Twins. At times, I suppose I should feel bad. The poor girl has no chance. I mean, as she was turning four, in May, she knew the Twins lineup. I would say, “Joe” and she would shout, “Mauuuuerrrr!” I would say, “Justin” and should would say “Morneau.” I would say “Michaelllllllllll” and she says, “Cuddya!” I say, “Denard?” and she says, while raising her eyebrows up and down, “Span Man.” Thome, Young, Kubel. Slllooooowweeeyyyyy. We’re now working on Nishioka. At one point, my sister just shook her head and said, “Wow… maybe next on your list of things to do should be Letter Recognition, or Addition?” Of course, her favorite of all remains TC Bear. So anyway, the two of us got there and guess what they had for their pre-caravan meal? You bet! They had nachos! And yes, I stuffed my face! We sat down in the third row, sitting in front of the big TV screen. A bit later, TC Bear came in and started taking pictures with kids. Jozie wanted to go to him. She was talking all big and brave, and even noting how other kids were being scared of TC, probably because they don’t know him as well as she does. But when we got to the front of the line, and it was her turn… she clung to me, and we had to get our picture taking with TC together… which was fine. Anyway, the show began with Kris Atteberry as host. He thanked everyone for coming out before announcing to the crowd that minutes before, the Twins had signed Carl Pavano for the next two years. Aside – Pavano signed for two years and $16.5 million. Starting last June, when Pavano was working wonders for the Twins, discussions first started about an extension. I remember saying that I would offer Pavano two years and $18 million at that time and if he took it, great, it would be a fair deal. If he didn’t, let him go. Well, I said all offseason that I would rather have the draft picks than give Pavano a three year deal or too many dollars. So, in the end, when the Twins got him for two years and $16.5 million, I was clearly just fine with it. Atteberry announced that there would be just five more questions. Jozie raised her hand. Atteberry came over and said, “Young lady, what is your question?” I didn’t know what she was going to ask, or what would come out. With the microphone is in her face, she said, “I want to play with TC Bear.” Good question. The Twins that were there signed several items and prize winners were drawn. After TC took a prize to a winner way in the back of the room, he came back to the front, but on the way, he gave Jozie a really big hug which made her smile and laugh and the look on her face was priceless. That alone made her night. Following the program, the Twins contingent went to the back of the room where they signed autographs and took pictures with the people. As you know, Jeff Manship has been a participant in the SethSpeaks.net NFL “Expert” Pick panel for at least the last four years. He is a terrific guy. 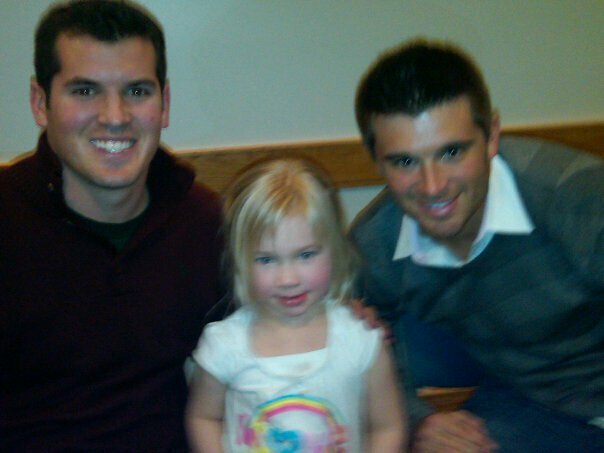 He and Drew Butera were willing to take this picture with Jozie (which from the response I’ve heard on Facebook and Twitter, primarily from the female population, is a pretty good picture?). 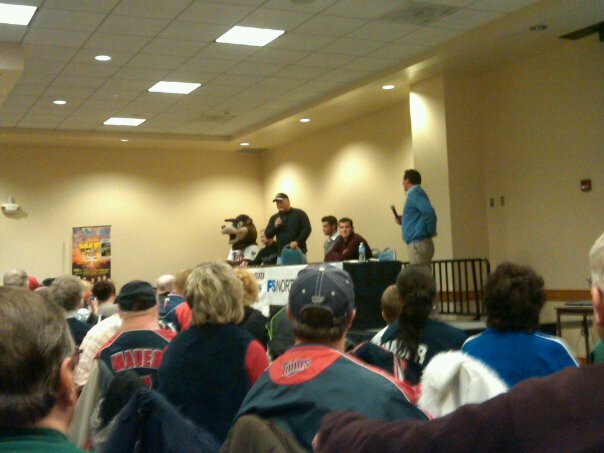 Again, the Twins Winter Caravan is wonderful on several levels. First, it’s an opportunity for people to meet and see first-hand the players and the manager and coaches that they see on FSN throughout the year. They get to see personalities and hear stories and jokes. They get to shake their hands in the autograph lines. They get to think about baseball even when temperatures are hovering around ten below zero. It’s a way to know that the season is close. The caravan will be traveling around the Upper Midwest next week as well leading up to Twins Fest weekend. There are a lot of reasons to be excited and optimistic about the Twins 2011 season and these types of events really help people get there! So, thank you to the Twins that were in Thief River Falls and made the event a lot of fun. Have you been to a caravan event yet? Will you? What are your thoughts and stories? If you have any questions or comments or want to share one of your experiences, please feel free to e-mail me or leave your comments here. On Monday afternoon, the Vikings suprised absolutely no one when they named Leslie Frazier as their eighth head coach. Another coaching change for a team that has had three head coaches in the past six years. On January 4, 2002, the Minnesota Twins named their 3B coach Ron Gardenhire as their new manager. He replaced Tom Kelly who had been manager since he replaced Ray Miller as Twins manager during the 1986 season. Kelly had been the Twins 3B coach prior to that. On January 10, 2002, the Minnesota Vikings named Mike Tice their full time head coach. He had taking over the reigns from Denny Green a few weeks earlier. Tice’s contract ran out after the 2005 season, and Brad Childress was brought in from outside the organization in January of 2006. As well all know, Mr. Childress was relieved of his duties six weeks ago. Frazier became the interim head coach and as had been anticipated for about the last year, he was named the team’s head coach on Monday. The Vikings have had three head coaches in the last six years and four head coaches in the past ten seasons. In the last decade the Vikings have made the playoffs three times. The Twins, on the other hand, have had two managers over the past 25 seasons. In the last decade, the Twins have been to the playoffs six times. This blog is not to say that one ownership methodology is better than the other. The Twins practice and preach continuity and with it, they have remained an annual contender and playoff team in the AL Central. The Vikings have made several changes in the past decade. They have just three playoff berths, but their run to the NFC Championship game earlier this year was sure fun to watch. The Twins ownership was known as frugal for a lot of years in the Metrodome, and rightfully so due to very low revenue streams. With the arrival of Target Field, the Twins have spent on payroll, increasing their payroll from just $65 million a few years ago to about $100 million in 2009 and upwards of $120 million in 2010. The Vikings have spent at least the salary cap in most of the years. In 2010, Zygi Wilf went way beyond the salary cap (in an un-capped season) in an attempt to “go for it.” How did that go? Will a new coach change the fortunes for the Vikings after one of the most disappointing seasons in the Vikings history? Brad Childress had lost his players completely. If there is one thing that will never happen, it is Twins players quitting on Ron Gardenhire. There are a lot of similarities between the Vikings and the Twins. Some positive traits. Some negative traits. It will always be amazing for me that the Twins have been the much more successful team the past decade and yet this remains such a Vikings state and region. Here’s to Leslie Frazier being the right guy to take the Vikings back to the playoffs, and to Ron Gardenhire for hopefully being the guy able to take the Twins to that next level. All I know if 94 wins in the regular season is a pretty good place to be. Is one management philosophy better than the other? What has firing and re-hiring done for the Vikings? What has continuity done for the Twins? Everyone can have a different opinion, and no one is right, and no one is wrong. What do you think? Feel free to e-mail me or leave your comments here. After finishing runner-up in the voting for American League Manager of the Year five times in his first eight seasons as Twins manager, Ron Gardenhire finally received an award of his own. Gardenhire edged out Rangers manager and 1987 Twins spring training competitor Ron Washington for the award. Of the 28 ballots, Gardenhire received 16 first-place votes, eight second-place votes, and four third-place votes. He was the only manager to appear on all 28 ballots. Washington received 10 first-place votes. Terry Francona finished in third, while Joe Maddon finished in fourth place. Ron Gardenhire led his team to a 94 win season despite a season full of injury and other distractions. Before the season even started, he lost his closer, Joe Nathan, to Tommy John surgery. Joe Mauer missed three weeks in late April. JJ Hardy’s wrist injury cost him significant time. Orlando Hudson was injured following a terrific catch. His season-opening 3B Nick Punto missed a lot of time. And Justin Morneau, who was putting up MVP-type numbers did not play after July 7th. Several players did not meet expectations, and yet, the manager coaxed the team to another AL Central title. Ron Washington was certainly a deserving candidate. Many believed that the Angels would be a lock to win the AL West yet again despite all of their losses on and off the field. The Mariners were supposed to continue to improve. But instead it was the Rangers who fought bankruptcy and a team sale to dominate the division. The Rangers dominant offense and surprisingly good pitching staff clawed and moose-eared their way all the way to the World Series, thanks in large part to second-half additions of Bengie Molina, Cliff Lee and others. Washington is a great story, overcoming his admission of cocaine use as recently as last year. The Rangers stood by him and he rewarded them. Washington is the epitome of a player’s manager. In the NL, Bud Black finished with one more point than Dusty Baker to win the award. Feel free to e-mail me or Comment here. The Baseball Bloggers Alliance began a couple of years ago. I was one of the first members to join, but now there are over 200 blogs associated. Last year was the first year that the group did its own award voting. This year, Hall of Famer Goose Gossage gave his name to one of the awards, the Top Reliever. So, over the next few weeks, the Baseball Bloggers Alliance will be voting on the following awards. With that background information, today I will be posting my ballot for the Connie Mack Manager of the Year Award. Despite some injuries in the pitching staff, inconsistency in the offense, and playing in the toughest division in baseball, Maddon led the Rays to the best record in the league. There were a lot of struggles in the offense outside of Carl Crawford and Evan Longoria. But Maddon allowed his players to be aggressive, running at will, to make things happen. A lot of times the best teams’ managers get overlooked for Manager of the Year awards, but Maddon helped his team to get there. Like the Twins of 2001, the 2009 Rangers showed life for most of the season, but faded at the end. But they made a few adjustments, several players improved and this year the Rangers finally took that big leap and got into the playoffs. The Rangers were clearly the best team in a very weak AL West division, and ran away with the division title. He coached Josh Hamilton to an MVP type of season. He had a very strong, very improved pitching staff. The decision to move CJ Wilson to the rotation was brilliant. Bringing back Colby Lewis was great. Washington was also helped by a front office that brought in the likes of Bengie Molina, Jorge Cantu, Cristian Guzman and Cliff Lee at the trade deadlines. He was given Vlad Guerrero before the season. He has helped groom the likes of Elvis Andrus and Neftali Feliz. He is definitely a player’s manager. Always a bridesmaid, this should be the year that Ron Gardenhire should finally be named the Manager of the Year. Gardenhire was given some help before the season with additions, such as Orlando Hudson and JJ Hardy. However, before the season, he lost his closer (Joe Nathan), and in early July, he lost an MVP candidate in Justin Morneau for the rest of the season. Joe Mauer, Orlando Hudson, Nick Punto, JJ Hardy and others missed significant time throughout the season. Yet Gardenhire led the Twins to a great second half and when the Twins went into Chicago to face the White Sox late in the season, he coaxed a sweep to essentially eliminate any hope for the White Sox. In the end, the Twins had a better record than all other AL teams except the Rays and Yankees. He also sent his team to the playoffs for the sixth time in Gardy’s nine seasons. There is my ballot. Would yours look different? Leave your comments here. The Twins entered the ninth inning down by a score of 4-3. Neftali Feliz, a rookie and yet one of baseball’s best and hardest throwing pitchers, came in to protect the lead. Delmon Young lined out to the warning track in right field. Danny Valencia was robbed of extra bases when Julio Borbon ran down a ball on the warning track in dead center. Ron Gardenhire sent Jim Thome to bat for Alexi Casilla, and Feliz hit Thome in the leg on the first pitch. Jason Repko pinch ran for Thome, and Matt Tolbert stepped to the plate to bat for Drew Butera. Tolbert struck out to end the game. The Twins lost 4-3. But those final decisions certainly created plenty of discussion. Point #1 – Since JJ Hardy was not used as a pinch hitter, it is clear that he is more hurt than we thought, that it was more than just a day off for the Twins regular shortstop. That is not a good thing, especially in this case when the bench is so diminished. Point #2 – Once Thome was on base, should Tolbert have been used as a pinch-runner, with Repko been used as a pinch hitter? Feliz had given up some rockets to right-handed batters to start the inning. Right-handers have hit Feliz a little better over the course of the season than left-handers. Since Tolbert struck out, it’s easy to say Repko could have done better than that. Unlikely since Repko traditionally strikes out much more frequently than Tolbert does. The reality, Jason Repko isn’t a good hitter, and Matt Tolbert is probably a little worse. Neither matchup was ideal. Point #3 – Maybe Drew Butera should have just batted for himself. First, if he had extended the game, the Twins would not have lost the DH. Since Tolbert and Repko are only slightly better offensive options than Butera, it had to at least be considered. Point #4 – I haven’t heard many people talk about this, but maybe the Twins should have just let Alexi Casilla bat so that Thome could have batted for Butera with a runner on base. The obvious reason that this is not a good answer is because if (or more likely, when) Casilla got out, then a hitter of the caliber of Jim Thome would not have even had the opportunity to tie the game. However, from the Rangers’ perspective, with Thome pinch hitting and Butera coming up (with Repko/Tolbert as pinch hitting options), why even pitch to Thome? Of course you walk him, or in this case, why not just hit him on the first pitch and take your chances with the Twins triple can’t hit options. None of those discussion options is a good option. Simply put, there was not a good answer for Ron Gardenhire in that situation. The Rangers have shown through two games why they are dominating the American League West. On Monday, the Twins got to see Rich Harden healthy, and how good he can be when healthy. On Tuesday, we got a better idea of just why the Twins went hard after Colby Lewis this offseason before he signed with the Rangers. Things do not get any easier in the next two games against the Rangers. CJ Wilson gets the nod tonight and Cliff Lee starts on Thursday. After the Twins swept the Rangers earlier in the season at Target Field, it will be tough for the Twins to win a game in Arlington. 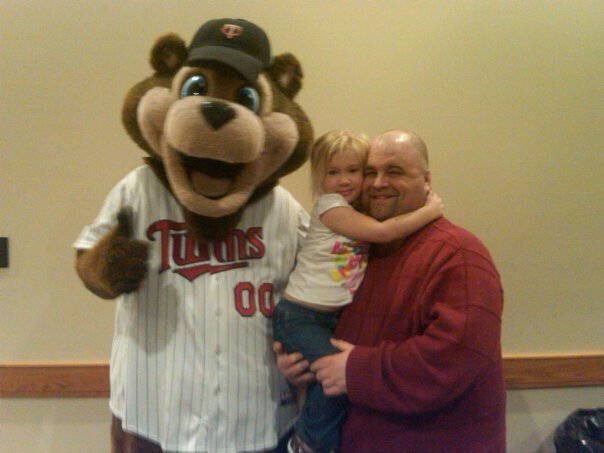 As previously mentioned, the Twins Geek, Sooze and I will be at Howie’s Sports Bar in St. Cloud for the TwinsCentric Viewing Party. The Twins play the Mariners at 3:00, so we’ll be there by 2:30 and throughout the game. There will be drink and appetizer specials, and prizes to be given away. Hopefully by having an event like this in the outstate will allow more people the opportunity to be there and meet many more Twins fans. Following the TwinsCentric Viewing Party, I am going to stay in St. Cloud and head over the Joe Faber Field. The St. Cloud River Bats of the Northwoods League (a college wood bat league) are hosting the Minnesota Twins alumni game at 7:05. Several former Twins players, including Corey Koskie, Jim Eisenrich, Juan Berenguer, Al Newman and several others will be playing in a game. There will be a lot going on throughout the night. Following the game, the player’s jerseys will be signed and auctioned off. Proceeds from the evening will be going to the Miracle League of Central Minnesota. Check out the River Bats website for much more information. Hopefully I can meet several of you at both of these events in St. Cloud on Saturday! Here is a quick glance at what happened on Tuesday in the Twins minor league system. For a ton of information on who is hot, who is not, which teams still could play in the playoffs and much more, please listen to last night’s Twins Minor League Weekly podcast. Rochester 4, Scranton/Wilkes Barre 5 – Kyle Gibson made his third AAA start for the Red Wings. In five innings, he gave up two unearned runs on two hits and two walks. He struck out five. However, of the 81 pitches he threw, just 49 were strikes. Kyle Waldrop gave up one run on three hits in 1.2 innings. Rob Delaney gave up two runs on three hits in 1.1 innings to take the loss. Dustin Martin went 3-5 with his 23rd double. Brendan Harris went 3-5. Brian Dinkelman went 2-5 with his 29th double. Game 1 – New Britain 1, Binghampton 8 – Chris Province gave up eight earned runs on 11 hits and two walks in 3.1 innings. He struck out three. Blake Martin threw two scoreless innings, allowing two hits and walking two. Mike McCardell got the final two outs. The Rockcats managed just five hits. Game 2 – New Britain 0, Binghampton 7 – Deolis Guerra started and gave up five runs (3 earned) on four hits and two walks in 3.2 innings. Santos Arias then gave up two runs on four hits in 1.1 innings. Billy Bullock struck out two in a scoreless inning. The Rockcat bats managed just three hits in this game. Ft. Myers 5, Palm Beach 1 – Bruce Pugh won for the sixth time this season. He gave up one run on three hits and three walks in six innings. He struck out four. Jhon Garcia threw three shutout innings to record the save. Deibinson Romero Yangervis Solarte was 2-3. was 2-4. Nate Hanson went 2-5. Drew Thompson went 1-2 with two walks. Allan de San Miguel hit his fourth homer, and Brian Dozier hit his third homer. Beloit 8, Burlington 11 – After such a rough start to his season, James Beresford went over the .300 mark on the season when he went 3-5 in this game. Steve Liddle went 2-4 with a walk and his 16th double. Josmil Pinto went 1-2 with two walks and his 17th double. Pedro Guerra got the start and gave up four runs (3 earned) on five hits and four walks in five innings. He struck out three. Nelvin Fuentes then gave up two runs on two hits and a walk in two innings. Sam Spangler came in and walked the two batters he faced. Miguel Munoz came in gave up both of those inherited runs and three more runs in the eighth inning. Elizabethton 4, Bluefield 5 – Through four innings, Blayne Weller was throwing a shutout. Then he gave up five runs and got just two outs in the 5th inning. At that point, the game was delayed by rain. Michael Tonkin came in when the game resumed and threw 3.1 shutout innings. He gave up just two hits, walked one and hit another batter while striking out three. Brandon Henderson went 2-4 with his fifth double. Andy Leer was 2-3. Danny Ortiz and Nick Lockwood were 2-4. GCL Twins 3, GCL Rays 4 – Ricardo Arevalo fell to 0-7. He gave up four runs (3 earned) on eight hits. In 4.1 innings, he gave up four walks, hit a batter and struck out two. Derek Christenson got the final two outs before the game was called on account of rain. Rory Rhodes went 2-3 with his fifth double and second stolen base. Eddie Rosario went 2-3. Any thoughts on the Twins or the minor league system? Feel free to leave your questions and comments here.